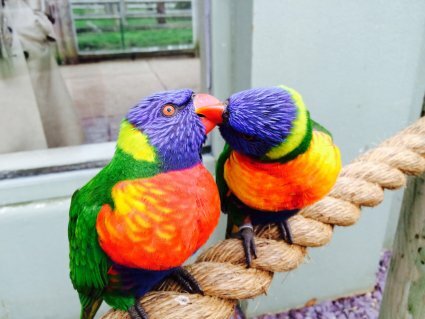 Providing an environment in which our animals can thrive is a huge priority at Drusillas Park and the team work hard to ensure each species has all the creature comforts they could possibly desire. 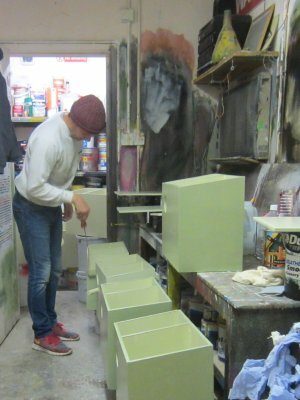 To this end, the Estate department has been busy creating new nest boxes for the zoo’s rainbow lorikeets this week. During the recent heavy rainfall it became apparent that their current boxes were not entirely waterproof. Concerned that this may deter the birds from breeding, the team got to work creating some new lorikeet lodgings. Creating the boxes fell on the shoulders of Estate Carpenter, Adrian Wickham. Using plywood, Adrian built eight houses each with a 80mm entry hole. The inside area was then split into two rooms, with a central divider so any future chicks could be cared for deep in the nest and out of the draft. A broom handle was cut down to create the perfect outdoor stand and a panel of wire netting was finally fixed inside, providing a ladder for the chicks to eventually climb up to fly the nest. 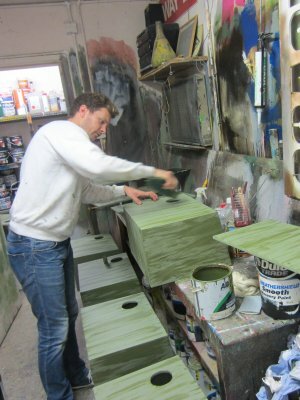 Once completed the boxes were then passed to Gawaine and the Archibald team to paint. To complement the jungle theme within Lory Landing, the boxes were painted green before being carefully camouflaged. Creating the desired effect required a little trial and error; a scouring pad was eventually settled on to apply the darker green paint. The final stage involved positioning the boxes in the optimum place for the birds to nest. To perform the honours, the boxes were returned to Adrian who secured them to the wall whilst the 43 colourful residents eyed up their new homes with interest. Hopefully, the lodgings will prove a real boost for the roost and the flutter of tiny feathers will be heard in the not too distant future.